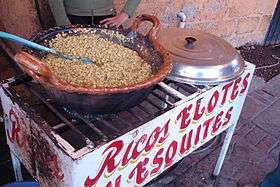 Esquites (or ezquites) (or troles and trolelotes in Northeast Mexico) also known as vasito de elotes (little corn-cup) is a Mexican snack or antojito. Shops and market stalls selling corn also tend to sell esquites. Festival and fair stalls may sell it too. The word esquites comes from the Nahuatl word ízquitl, which means "toasted corn". Esquites is generally made from mature corn, not fresh or dried. In one recipe, the grains of corn are first boiled in salted water. Then they are sautéed in butter with onions, chopped pequin chiles, epazote, and salt. 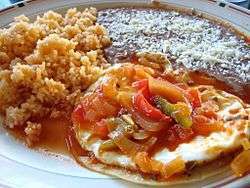 It is served hot in small cups and topped with varying combinations of lime juice, chile powder or hot sauce, salt, and mayonnaise. Esquites is also known in some other countries such as Iran where it is known as Mexican corn. ↑ "Elotes y esquites para quitar el antojo". TV Azteca (in Spanish). Retrieved 2010-09-25. ↑ Gonzalez, Dommy. "Street Food: Welcome to the Season of Esquites: Mexican Grilled Corn". LA Weekly. Retrieved 2010-09-25. ↑ Patronite, Rob; Raisfeld, Robin. "The Esquites Man". New York (magazine). Retrieved 2010-09-25. ↑ Cardona, Gloria (2007-09-01). Esquites. Delicias vegetarianas de México (in Spanish). ISBN 978-968-860-836-4. Retrieved 2010-09-24.